Stetson has been recognized many times over the course of his productive life. For his book, Grits & Grunts: Folkloric Key West. Honored for Kennedy's lifetime achievements on behalf of human rights and the environment. 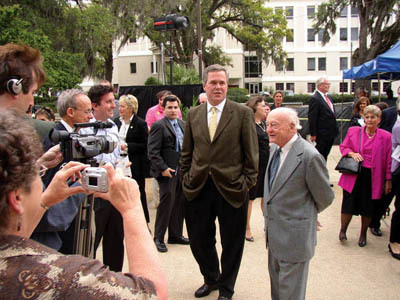 The National New Deal Preservation Association is indebted to and grateful for the pioneer and lifetime work of Stetson Kennedy who, at the age of 21, was put in charge of folklore, oral history, and ethnic studies for the WPA Florida Writer’s Project and has continued to inspire a generation of scholars and oral historians. Morehouse College Atlanta, GA “In the tradition of Mohandas K. “Mahatma: Gandhi, Dr. martin Luther King, Jr. and Dr. Daisaku Ikeda, you have served your community and the world through your dedication to peace and unity, your commitment to nonviolence, and your persistent efforts to establish justice for all humankind. Awarded by the State of Florida, Department of State, Division of Cultural Affairs. Jeb Bush, Governor. Glendale E. Hood, Secretary of State. Jacksonville Urban League Jacksonville, Florida “In recognition of the significant contributions you have made over several decades in fighting for human rights, fair treatment, and equal opportunity, and for following the literal mandates for the constitution advocating freedom and justice for all. Stetson Kennedy accepts the Dr. Benjamin Spock Peacemaker of the Year Ward in 2001. Watch his acceptance speech from 2001. Presented by, Florida Governor Lawton Chiles. Jacksonville, This is an award reserved for citizens who exemplify long-term commitment and service to their communities. nominated by The Giraffe Project, Langley, WA. St. Martin De Porres Association, Archdiocese of Miami, FL, Co-Recipient Katherine Dunham, et al (1992 recipient Jimmy Carter et al). Intercontinental Conference on Civil Rights and the Force of Law, Juridica, Nantes, France, Monnaie de Paris, Prix De l’Edit de Nantes. First tri-state Meeting of Florida, Georgia and Alabama State Historical Societies – Celebrating 50th Anniversary of Palmetto Country and author’s 75th Birthday. Madison Square Garden, NY “Who has shown a deep concern for the Welfare of Human Society and has opposed all forms of bigotry that would destroy our unity and with it our way of life.” Other recipients: Paul Robeson, Howard Fast, et al.